In order to understand the underlying mechanism behind the value of GNT, we should first emphasize the most crucial features of this token and its role in the Golem Network. The number of GNT (i.e. the supply) is going to be indefinitely fixed at the level created during the Golem crowdfunding. No GNT is going to be created afterwards. GNT will be necessary to interact with the Golem network. At first, its sole role is to enable the transfer of value from requestors to providers, and to software developers. Later on, the Transaction Framework will make it possible to assign additional attributes to the token, so that, for example, it is required to store deposits in GNT. 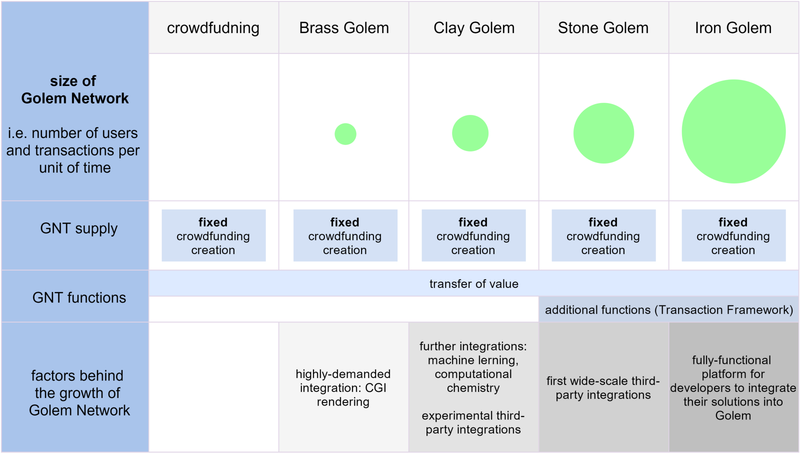 The true potential behind Golem lays in its potential for wide-scale adoption. In every release scheduled in the whitepaper, new features are added in order to facilitate both horizontal and vertical expansion. Each of these will be supported with corresponding marketing efforts. A depreciation or appreciation of the token is neutral to the operations of the network, because users are free to set any ask/bid prices for compute resources in Golem, thus accommodating any fluctuations in GNT value. Wrapping all of these aspects together, there is a convincing economic argument for a strong and positive correlation between the market value of a unit of GNT, and the sheer size of the Golem network: the constant amount of tokens will have to accommodate a growing number of transactions, hence increasing the demand for GNT. With a reasonable assumption that the velocity of the token (i.e. the number of transactions per unit of the token in a specific period) is constant over time, this conclusion can be drawn from the quantity theory of money. This, in turn, means that the overall success and growth of the Golem network implies a long-run appreciation of the GNT. These dry economic concepts are valid only as long as Golem has a true market potential. Why do we believe this is really the case? Let’s start with some numbers. Cloud computing is a huge market, with a yearly turnover of $175 billion in 2015, estimated to grow to $203.9 in 2016. In particular, the market for SaaS on the cloud is estimated to be worth $37.7 billion. Infrastructure services (PaaS and IaaS) are estimated to be worth $27 billion. These numbers are mind-blowing, exceeding the capitalization of all crypto assets today (i.e. approx. $13 billion). Why is this relevant to Golem? As we emphasize in our whitepaper, our goal is to create an almost perfectly competitive market for computing and software. We are going to start with low-hanging fruits such as CGI rendering (our own *minimum* estimate of public cloud rendering is $200 million a year), and later move on to other promising computing-intensive applications: machine learning, scientific computing, and business analytics. However, what is really important down the road, are microservices and the ‘true cloud’ functionality, which will allow Golem to offer features similar to what is offered by public cloud services today. If you think the quality and reliability of services provided by individual computers may not be sufficient for some of these services, you are quite right! That is why Golem is creating a market for allcomputing resources, datacentres included. Does Golem really have a price advantage over cloud-based solutions? The market for compute resources created by Golem is going to be highly competitive, which will inevitably bring prices down. And as we have said before, the potential for price decreases is a direct consequence of the high margins enjoyed by providers of cloud services. This certainly applies to such heavyweight players as AWS and Microsoft. Despite some signs of growing competition (aka price wars between major cloud providers), this market is still an oligopoly, which always leads to higher prices for the final user. For this situation to change, an entirely new market configuration is needed, with lower barriers to entry and efficient ways to make use of existing and underutilized compute infrastructure. This is exactly where Golem comes in. We want to redefine this huge market, and the GNT is going to provide the ‘payment rails’ for this new and growing ecosystem. Our GitHub Repository is Now Open!